Q. Can you tell us about your act at Cirque du Soleil? My act is Hairceau, which is a combination of hair-hang (yes, I am actually hanging by my hair!) and aerial hoop. It is an original concept that I came up with around two years ago, while trying to create something new and unique with hair-hang. I am super grateful to be performing this new act with Cirque du Soleil, which has been my goal since I started creating it! In Cirque du Soleil BAZZAR, my performance is part of the final act, when the celebration breaks [out] in a grande finale of dazzling acrobatics: Icarian duo, Hula Hoop, and Hairceau. Q. How did you decide to become an artist at the circus? 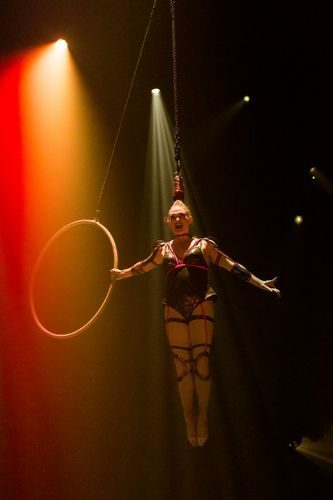 I fell in love with aerial arts at a summer camp when I was 14, and never stopped!I love that in any Cirque du Soleil show, we are not just doing our act but we are also a character and we have a lot of other little parts in the show. In BAZZAR, I have absolutely loved developing my character; I gave her the name Salamandra. Q. What is your practice regime like? As artists, we perform around ten shows a week, which makes our routine extremely hectic. In order to maintain a balance for a healthy lifestyle, we are provided with fitness training and are taught breathing exercises. One month before the première, we start training and rehearsing for our shows. Q. How has it been performing in India? There is nothing more exciting than performing for an audience that has never before experienced Cirque du Soleil. There is a very special energy in this first.